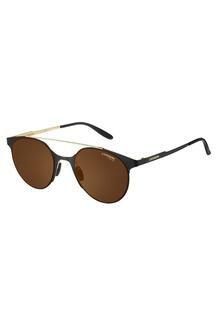 Walk down the lane of fashion by wearing this pair of browline sunglasses from Carrera. It features polycarbonate lenses that ensure clear vision and at the same time protect your eyes from the harmful ultraviolet rays of the Sun. It also has a plastic frame that keeps the lenses in a proper position. This pair of browline sunglasses will be a worthy pick for all the fashion conscious person, who prefer to stay in sync with the current trends. Wear it while you are casually attired to hit the road in style. Carrera - synonymous of pioneer design and outstanding quality – is a statement brand since 1956 for people who live by their own rules, continuously defying themselves and proudly approaching life standing out from the crowd. Carrera is one of the 5 important in-house brands of Safilo. Safilo is the second-largest manufacturer of eyewear products worldwide in terms of turnover and the world leader in the premium eyewear segment.